As all media continues to lean towards digital and fewer printed pieces are being made, people still ask for printed type specimens. P22 has decided to redouble its efforts to keep print alive and has started the P22 specimen chapbook series. Each of these 32 page books are printed in a limited edition of 1500 with hand printed letterpress covers featuring metallic inks on chipboard (except #s 8 & 9 which are 4 color offset covers). 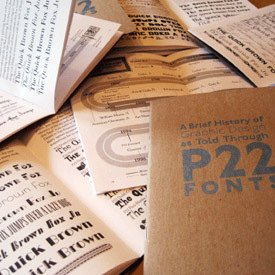 Each book measures 4.5" x 6.5" and showcases a specific P22 collection, font family, or style of font. 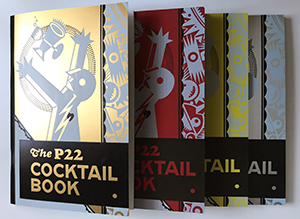 #10 - P22 Cocktail Book - The pages of this book are filled with contemporary cocktail recipes provided by friends and associates of P22 (Including the Brothers Quay, Rod McKuen, and a cadre of typographic movers and shakers). 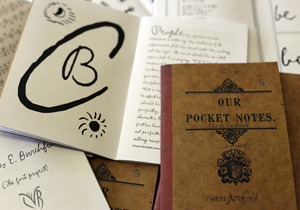 Each spread has been designed by James Grieshaber with P22 borders, ornaments, and headline fonts evocative of the recipes they are illustrating to showing the diversity of the P22 font library. Covers are letterpress printed in black and light blue inks on one of four color-ways: Chromolux Metallic Gold, Chromolux Metallic Silver, Curious Cosmic Pulsar Red, or Curious Skin Absynthe stock. Insides printed black and light blue on coated stock. #9 - P22 Ornament Coloring book - 30 pages of ornament arrangements designed by Richard Kegler and James Grieshaber showing the diversity of the ornaments found in P22 fonts sets. 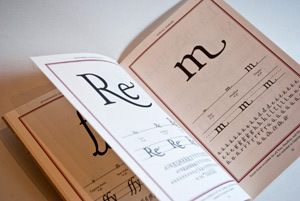 #8 - Charles E. Burchfield - The Font Project - The Burchfield-Penney Art Center in Buffalo featured an exhibit of work by P22 Type Foundry which highlighted a special font commissioned by the BPAC. This font based on the handwriting of noted American artist Charles E. Burchfield is not actually available for sale, but rather it is a proprietary font made for the museum. See more images of this book on this Behance page. 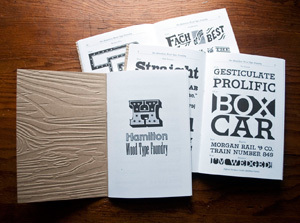 #7 - Hamilton Wood Type Collection - The HWT Collection chapbook was an unexpected addition to the P22 chapbook series. 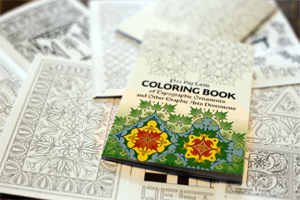 The cover is embossed with a wood grain and foil stamped logo. The inside is styled after the classic Wm. 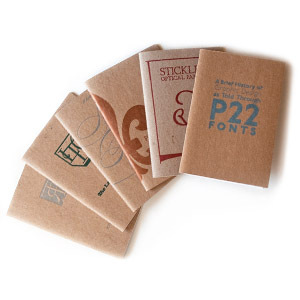 Page & Co. pocket sized wood type specimen books. For more images of this book, see this Behance page.